Going gluten free means no more yummy biscuits…or does it? While these Garlic Biscuits in a Mug are not exactly like their gluten-y counterparts, they make a great substitute for those who can’t eat gluten. 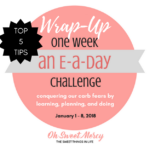 Low carbers, Keto peeps, and the Trim Healthy Mama wanting something biscuit-y with her satisfying S meal will all enjoy them. This updated recipe now includes big batch instructions as well as how to use THM Baking Blend. Biscuits. Oh how I love biscuits! Unfortunately, they don’t love me back. I’ve been eating gluten free for several years now and eventually you kind of get over wanting bread, for the most part. Every now and then you really crave it. 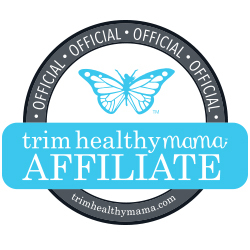 The great thing about Trim Healthy Mama is that you can find tons of great recipes for the foods you used to love that are on-plan. No, they’re not always exactly like the foods you used to poison your body with eat, but they are pretty close and sometimes, even better. Biscuit connoisseurs and coconut haters, move along. I do know what makes a good biscuit. Flaky. Crispy on the outside. Soft and warm on the inside. Usually made with white flour. Mouthwateringly delicious with gobs of butter and honey. So before you get upset that these aren’t exactly like that, remember that these are biscuits that Trim Healthy Mamas (and gluten free peeps) CAN eat without guilt or detrimental consequences to their waistlines. So while they’re not big fluffy southern-style buttermilk biscuits, they are a great on-plan and low carb option. I had them with Spaghetti Soup last night and it was such a delicious, satisfying S meal! If you absolutely hate coconut flour and can taste a coconut a mile away, you may not like them. I found that the slightly coconutty flavor was mostly covered by the garlic, yet still was a nice combination. This is a single-serving mug recipe, so why did I call it Garlic Biscuits in a Mug? I usually cook my Mug recipes in this adorable square Corningware Etch dish but used a coffee mug this time because I wanted round “biscuits.” Then I used a bread knife to cut into into four delicious biscuits. YOU MAY LIKE Welcome to the New and Improved OSM! The coconut flour and golden flax combination make a lighter texture. I think flax makes things seem very dense and heavy sometimes. And, just like with my Dark Chocolate Coconut Cake in a Mug, adding Greek yogurt helps counteract the dryness that is often present when using coconut flour. 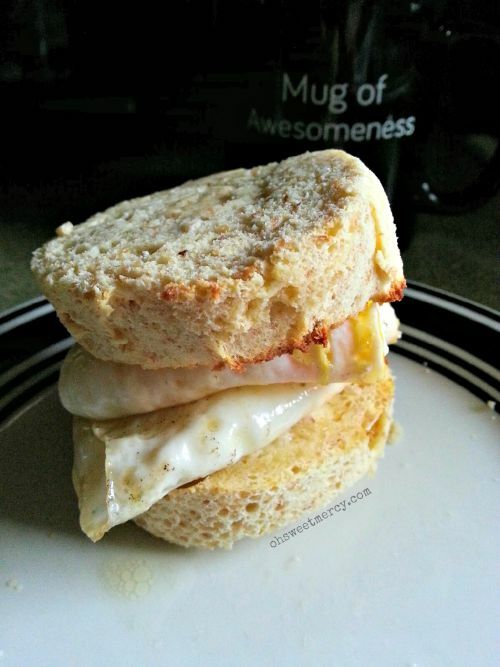 If you happen to have leftovers, they toast very well and make terrific egg biscuit sandwiches for breakfast. Or you can just make them for breakfast, too. They are very quick for busy mornings! My experience with coconut flour recipes is that they tend to take longer to cook. If you start slicing your Garlic Biscuits in a Mug and notice it’s not cooked all the way through, just pop the portion that is not cooked all the way back in the mug and back in the microwave for another 30 seconds or so. Since all microwaves vary, you’ll just have to experiment a bit to find the right length of time for your microwave. Reader question…Can I use THM Baking Blend? At the time I developed this recipe, I did not have THM Baking Blend. One of my readers asked if you can substitute the Baking Blend, so of course now that I have some Baking Blend I had to try and see. Fortunately, the first try produced excellent results! I’ve updated the recipe below to include substituting Baking Blend. Thanks, T.G., for the question! Mary wanted to know about baking in the oven since microwaves may not really be healthy for cooking. If you choose not to nuke your food you’ll also find easy oven instructions in the updated recipe below. Thanks for asking, Mary! If you don’t have THM Baking Blend, you can order some here, from my affiliate. I’d be blessed if you do and it won’t cost you anything extra! What about Homemade “Baking Blend” versions? I have NOT tried this with a homemade baking blend. But if you do, I’d love to hear how it turned out so please come back and share! I know my readers would also love to hear your experience, since many THMs make their own baking blends. While updating this post after the Big Blog Redo the other week, I decided biscuits and gravy sounded good for supper. I whipped up a batch of these yummy biscuits using a DIY “baking blend” and they turned out perfectly as well. I’ve used two different recipes for homemade baking mix. Both this one by Nili Barret on Chrissy Benoit in Love and this one from Meandering With Meg have worked well for me. I never have whey protein or else I’d try Briana Thomas’ recipe, I’ve heard it works well too. 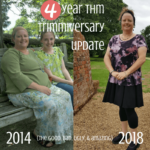 If you use other versions of homemade THM Baking Blend, your results may vary! 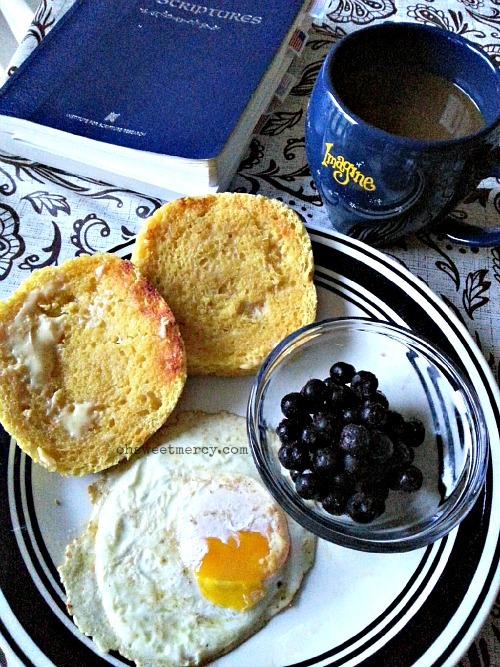 This S breakfast included the THM Baking Blend version of these Garlic Biscuits in a Mug (cooked in my favorite square mini baking dish), sliced and toasted with some yummy Kerrygold grassfed butter, a fried, freshly-laid egg from one of my “girls”, 1/4 cup organic blueberries and coffee with THM Pure Stevia Extract and half and half. This was one very SATISFYING breakfast! How these Garlic Biscuits in a Mug fit into your THM healthy eating plan. These mug biscuits are always an S, so enjoy with an S meal and be sure to keep the carbs for your meal in the S range. Since a Fuel Pull is a neutral fuel type, you can also enjoy these with any FP foods (it will just change your meal type to S!). Always be sure to center your meals around plenty of healthy protein and lots of fresh non-starchy veggies! 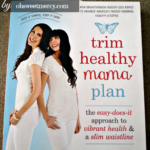 Refer to the Trim Healthy Mama plan book for the details. 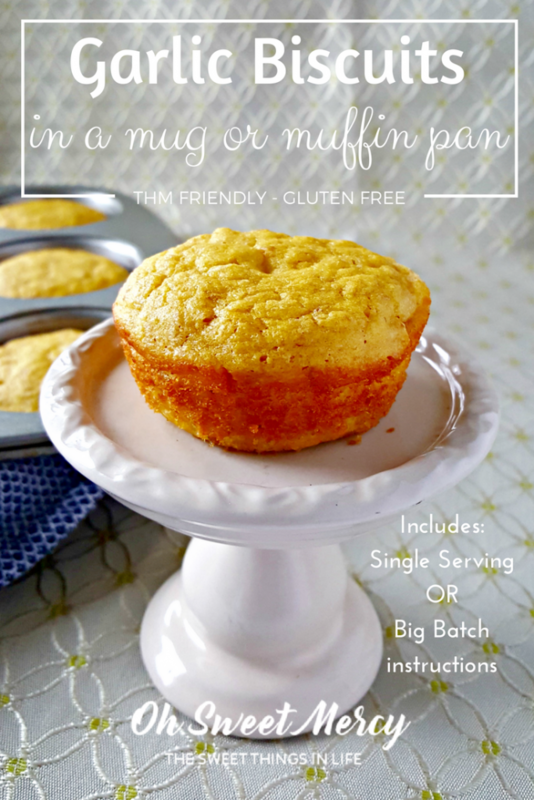 A quick and easy gluten free, low-carb bread option that pairs deliciously with your favorite THM S meals. I've found that coconut flour recipes tend to take longer to cook. If you start slicing your Garlic Biscuits in a Mug and notice it's not cooked all the way through, just popped the portion that is not cooked all the way back in the mug and back in the microwave for another 30 seconds or so. Since all microwaves vary, you'll just have to experiment a bit to find the right length of time for your microwave. Be Sure to Pin this Garlic Biscuits in a Mug Recipe to Your Favorite Pinterest Boards! Shalom Cydnie! It’s always a blessing to find another Torah keeper and a double blessing when she’s a fellow THM 🙂 Hope this recipe satisfies your cravings! Thanks so much for stopping by and for the comment. Have a wonderful Sabbath! Hi. Thanks for this great recipe! I was wondering do you think it would work to quadruple this and use it as a pizza crust and bake it in the oven? If so, would it be best to prebake then top and bake again or spread, top, and then bake all at the same time? Thanks! Oh Sweet Mercy is the best description of these. I’ve been longing for an S bread that didn’t just make me gag and wish the meal was over. These are so soft and yummy and I am a biscuit lover. The yogurt makes them so nice and moist and the garlic gives them just the right flavor to distract from the egg and cocnut. Thank you, thank you, thank you. LOVED these! This is now my default recipe! Thank you very much! I forgot to add that I am allergic to dairy, so I used mayo instead of yogurt or sour cream. They come out great! This was our garlic bread for Thanksgiving, and it was delicious! I stirred in some minced garlic chives and made 3 batches, each micro-baked in a small, square container. I then sliced each roll vertically and horizontally (to make 12 small slices) and toasted them in the conventional oven. Next time, I’d like to try baking them in a muffin pan in the regular oven, maybe with convection. My whole family was impressed with this light, savory bread. Thank you for sharing! If you don’t have a microwave, could they be cooked in the oven? Sure…I’d do 350 degrees for about 12 minutes or so. Could you use THM baking blend instead of t g e flax and coconut? If so how would you sub it? I didn’t have any Baking Blend when I made this but I do now. I’ll experiment tomorrow and update the recipe. Thanks for asking! Since Microwaving is really bad for “cooking” food can you give a recipe to be baked in the oven. Hi Mary! Thanks for stopping by and for your question. I have updated the recipe for baking in the oven. I used this as the bread crumb topping for my broccoli cauliflower gratin that I served with our Christmas ham… Delicious! As an added bonus, my family didn’t notice that I revamped the recipe to be on plan! Thanks! That is a GREAT idea, thanks for sharing! Isn’t it great when your family can’t tell the difference? I’m new to THM but I must say, I LOVE it! This recipe is my favorite so far! It’s so simple to make & it truely tastes like a real biscuit! Thank you so much for your recipes. You make it so much easier for newbies to get started! I’m so glad you like this biscuit recipe and that it has made your new THM journey easier, thanks so much for letting me know! I’m not a fan of the THM baking blend. I think it is the oat fiber in it that my tongue doesn’t agree with, unfortunately. Could you also list the amounts of coconut flour and flax you used, in addition to the THM ingredients? Hi CG, if you take a look again at the recipe, you’ll see that the original recipe (without Baking Blend) is there, I just added the amount of Baking Blend to use instead of the coconut flour and flax below the original recipe. I’m sorry – I’m sleep deprived with a newborn in the house, so I may not be seeing clearly – but where is the recipe? I scanned it a bunch of times. Anna I’m sorry! I’m having some technical issues with the site right now, but I’m furiously working to fix them!! Where did the recipe go? I’ve used it before and kept the pin, but the recipe disappeared. Thank you so much, I printed the recipe so I wouldn’t lose it. I love this for a breakfast sandwich. Thanks for sharing! You’re so welcome. I’m sorry for the inconvenience…it’s been a rough week here for me in blogland but I’m pressing onward! I’m glad you could print it! This is my 2nd day in, I had a question. How do I know I am pairing this with enough protein if I made a bacon and avocado, tomatoe sandwhich out of one of these biscuits (I did the big batch and divided it into a 12 muffin tin)? Am I needing to make sure I have enough protein so my body does what it needs with the fat? Hi Rachel, thanks so much for stopping by and letting me know how you liked this recipe. I always love to hear from my readers! And love to hear hubbies joining too! As far as the protein goes, you want to center your meals around a protein source. THM recommends 20 grams of protein…I’m not sure of the protein amount in bacon. I put the recipe in the recipe analyzer at caloriecount.com and each biscuit (the big batch made in a muffin pan) has 3.6g protein. You could add a Fuel Pull smoothie with collagen or some of my Lemon Turmeric Gummies for extra protein . Other protein options include cottage cheese, Greek yogurt (keep in mind the biscuits have 2 carbs each) and hard boiled eggs. Hope that helps! Oh yum! These sound so good! Love the garlic. 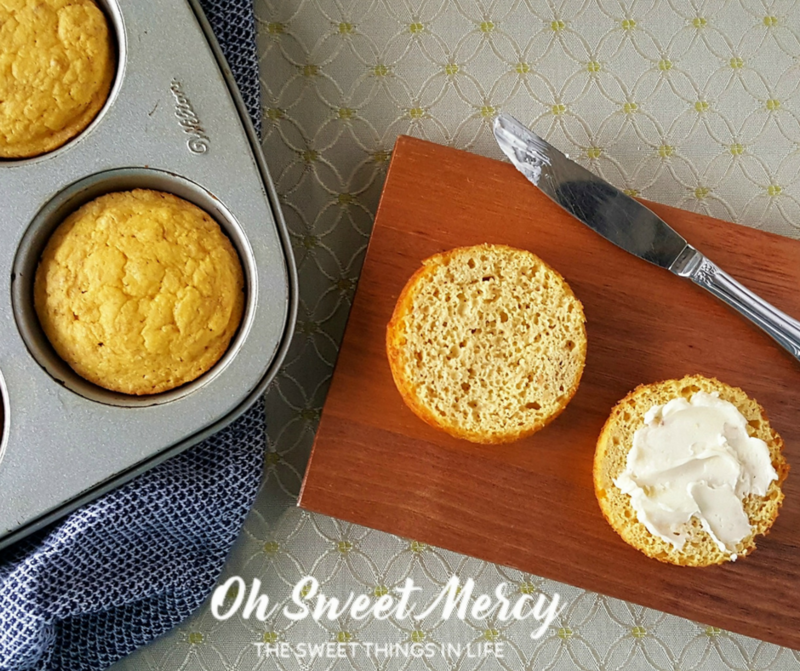 Thanks so much for sharing this at Savoring Saturdays linky party! Do you also omit the water in the big batch recipe using thm baking blend? I go by the consistency of the batter. Coconut flour can vary by brand and even batch. If it seems very thick and dry, add some water. If it seems like muffin batter, feel free to leave it out. Thanks for stopping by! These were so yummy!! My kiddos were eating cinnamon bagels and the smell was making me have major cravings! I found this recipe through a Google search. I subbed in sugar replacement plus some cinnamon for the garlic, and they turned out super yummy!! And took care of my craving! The texture was perfect too! Wow Ronnie, that’s a GREAT tweak, thanks for sharing! Best biscuit ever!!! Thanks so much!!! Thanks Staci! I’m so glad you like it. It’s a favorite of mine too! Hey! I’m super excited to try this recipe as almond flour bothers me and I have a hard time finding good recipes to use coconut flour with. Only question would be do they have an egg like taste? I’m Keto and found a lot of recipes to taste like a baked egg. TIA! I don’t think they taste eggy myself. You could try using an equivalent amount of egg whites instead of a whole egg. The yolk is where that strong, eggy flavor comes from. Hope you like it! 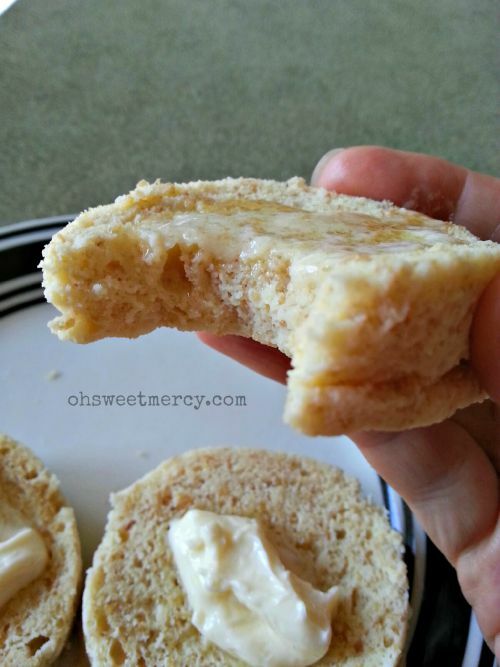 I have to say this is by far the best mug bread recipe that I’ve tried! Thanks so much for posting. Do you have the nutritional info? How could I use oat flour instead of coconut? Using oat flour in place of the coconut flour would be tricky. For one thing, oats are primarily an E fuel, and with the fats in this recipe you’d end up with either an S Helper or Crossover. The second thing would be that coconut flour is highly absorbent – very different than oat flour. You’d likely need quite a bit more oat flour to make up for the coconut flour. I know that a very small amount of oats, such as in Pearl’s meatloaf recipe I believe, is OK in an S recipe but I really think the amount of oat flour you’d have to sub here would push it out of that OK range. I know many people don’t like coconut flour, or are allergic, and I’m sorry to say that oat flour isn’t probably the best substitution in this recipe! Thanks so much for stopping by and reaching out, I sure appreciate it! I found this through Pinterest and I’m obsessed! I’ve been making the mug version and am thinking I should make a full batch. I’m wondering if you know how these freeze? I’m so glad you’re loving them! I haven’t frozen any myself (no leftovers 😉 ). 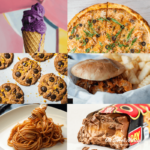 You could try making a single recipe and freezing to see if you like how it turns out, that way in case it doesn’t freeze well you don’t waste a ton of ingredients. I’m thinking it probably will freeze ok. Thanks so much for stopping by, and do let me know how it turns out for you! I made two of these in the microwave and they were just ok. I did add stevia instead of garlic powder for a breakfast muffin and next time I’ll make them in the oven so they will get a little drier. They came out like a sponge cake in the microwave. Yes they are not exactly like real biscuits. Sadly, only real biscuits are! But when you can’t have the flour (or gluten) you have to get creative, right? You could also try slicing and toasting them, I enjoy them that way for breakfast sandwiches! Thanks for coming back and letting me know what you thought! Hey Abigail! Thanks so much for coming back to let me know how they turned out for you. So glad you enjoyed them! Thank you so much for this recipe! My daughter and I have Celiac’s. I have found grain free mug breads and am in love! This was so delicious! It’s nice to have bread again that is yummy and good for you. Also the tip about tapping the bowl before cooking solved a problem that I was having. I would get an area in the top of my mug cakes that won’t finish cooking. Thank you!